A client user is a member of client’s staff that can log in to the Back Office application to work with client’s service requests, inspections, work orders, repair orders, invoices, reports, etc. On the Client Users page you can add, edit, and delete client users, as well as assign them to other clients. 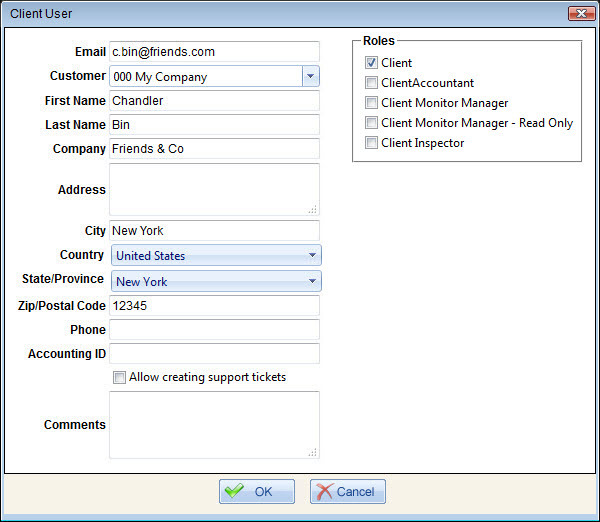 To assign an existing client user to other clients, in the Clients column, click the Clients link next to the appropriate client user, and then add clients on the Assigned Clients page. Note When a new client user account is created for a client user who has not yet been registered, the registration email with a confirmation link is automatically sent to client user’s email address. Client user must click the confirmation link, and then enter and confirm the password in the Registration form. 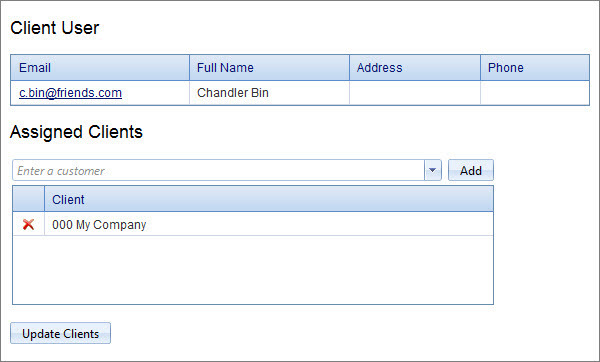 Tip In the Status column you can see whether client users are registered. If some client users did not set their password, the Not Confirmed message is shown, so you can click Re-send to send the registration email again. You can find client users by name, email address, and client they are assigned to. In the Search pane, select the appropriate client in the Client box, enter name or email address in the User box, and then click Find. On the Assigned Clients page, you can assign the given client user to multiple clients. Click the appropriate client in the box, click Add, and then click Update Clients. Tip To remove client assignment, click Delete next to the appropriate client. When you create a new client user account or edit an existing client user account, you enter or change settings in the client user profile. Email acts as username when client user logs in to the Back Office application. Customer lets select a customer to which the given client user is assigned. Allow creating support tickets lets client users submit support cases to the AMT Support System. Client Monitor Manager is a role that lets client users work with Monitor and its dashboards, some operational and reporting data. Client users with the Client Monitor Manager role can change the status of repair orders. Client Monitor Manager - Read Only is a role that provides the same kind of access as the Client Monitor Manager role, however in the read-only mode only (without ability to change anything). If the Client Monitor Manager - Read Only role is selected, you cannot select any other role. Note Features available for client users depend on your application subscriptions. For example, if you want client users to see work orders, the ClientWorkOrders feature must be turned on for your Back Office application.